Drs. Paul Kim, Wade Gofton, Phil Wells, Marc Rodger, Marc Carrier and Doug Coyle co-authored a study in the New England Journal of Medicine that found aspirin to be just as good as the blood thinner rivaroxaban for preventing blood clots after a hip or knee replacement. These blood clots can be deadly if they travel to the lungs, and are the third most common cardiovascular cause of death after heart attack and stroke. All 3,424 patients in the trial took rivaroxaban for five days after their surgery. Then half the patients continued taking rivaroxaban while half took aspirin for an additional nine days for a knee replacement or 30 days for a hip replacement. Results showed that the two medications are equally safe and equally good at preventing blood clots. Aspirin costs much less than rivaroxaban, so this study could lead to significant savings for the health-care system. 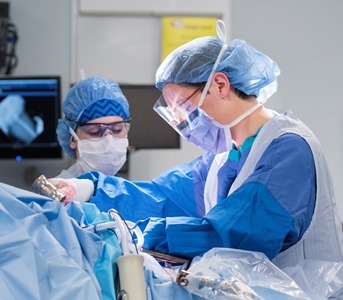 There were 53,000 hip and 64,000 knee replacements done in Canada in 2015. Authors: David R. Anderson, Michael Dunbar, John Murnaghan, Susan R. Kahn, Peter Gross, Michael Forsythe, Stephane Pelet, William Fisher, Etienne Belzile, Sean Dolan, Mark Crowther, Eric Bohm, Steven J. MacDonald, Wade Gofton, Paul Kim, David Zukor, Susan Pleasance, Pantelis Andreou, Steve Doucette, Chris Theriault, Abongnwen Abianui, Marc Carrier, Michael J. Kovacs, Marc A. Rodger, Doug Coyle, Philip S. Wells, and Pascal-Andre Vendittoli. Funding: This study was funded by the Canadian Institutes of Health Research. Clinical trials at The Ottawa Hospital are possible because of generous support from the community for Research to Improve Patient Care.